Antonio Vivaldi; Franz Schubert; Frédéric Chopin; Giuseppe Verdi; Johann Sebastian Bach; Johann Strauss II;... Very Good. In very good packaging. 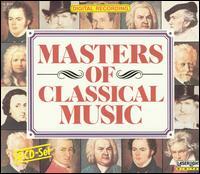 Various-Masters of Classical Music [BOX SET] [IMPORT] by Various. Fair. Some wear to box and inserts Buy with confidence-Satisfaction Guaranteed! Satisfaction 100% guaranteed.